Hans Andersen Brendekilde (1857–1942), Cowed (1887), media not known, 126 x 152.3 cm, Fyns Kunstmuseum, Odense, Denmark. Wikimedia Commons. The more I see of late nineteenth century painting, the more unhappy I become with its popular account in terms of Impressionism and Post-Impressionism. Wonderful and important though they are, this is grossly oversimplified and omits the rising role of paintings in social change, seen most clearly in the almost forgotten Naturalist movement. Because Naturalist painting necessarily told stories and used traditional style for their expression, it is today considered reactionary and antiquated. It is often difficult to read Naturalist paintings now, because of their deeply embedded historical and social context. At the time, they were not only highly popular, but had observable impact on changes in European and North American society. They are also, in the main, superb works of art in their own right. This short series looks at the paintings of two of the great Danish ‘social realists’, or Naturalists, Laurits Andersen Ring (1854-1933) and his close friend Hans Andersen Brendekilde (1857–1942). Both shared the same surname at birth, originally being Laurits Andersen and Hans Andersen, hence the title. 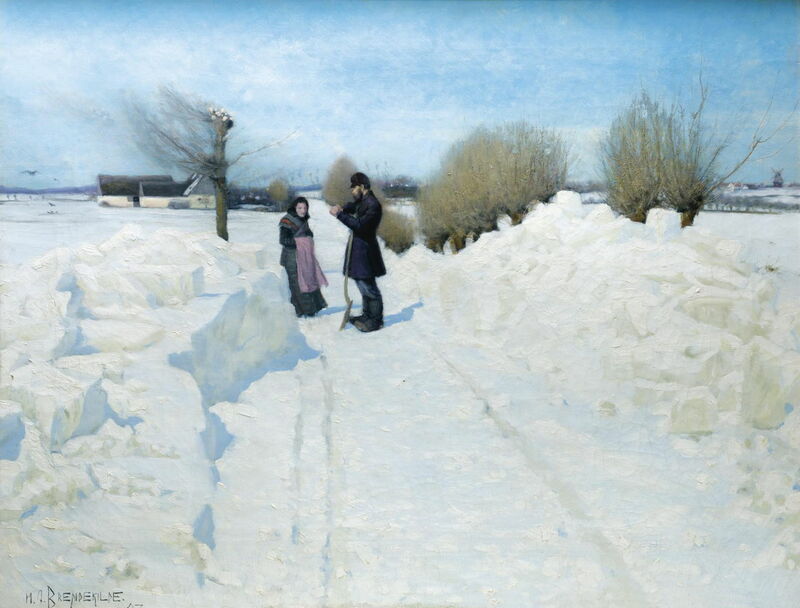 In 1881, when they feared confusion at exhibitions of their work, they decided to adopt the name of the villages of their birth as their last names: Laurits Andersen then became L A Ring (as he is invariably known), and Hans Andersen became H A Brendekilde. Both had humble origins, in relatively poor rural families, Ring in the south of Sjælland (Zealand), Brendkilde near Odense on the central island of Fyn (Funen). Brendkilde worked as a houseboy to a local farmer before being indentured as an apprentice to a sculptor in Odense, after the age of 12. From there, he gained a place at the Royal Danish Academy of Fine Arts in Copenhagen, where he studied sculpture from 1877. 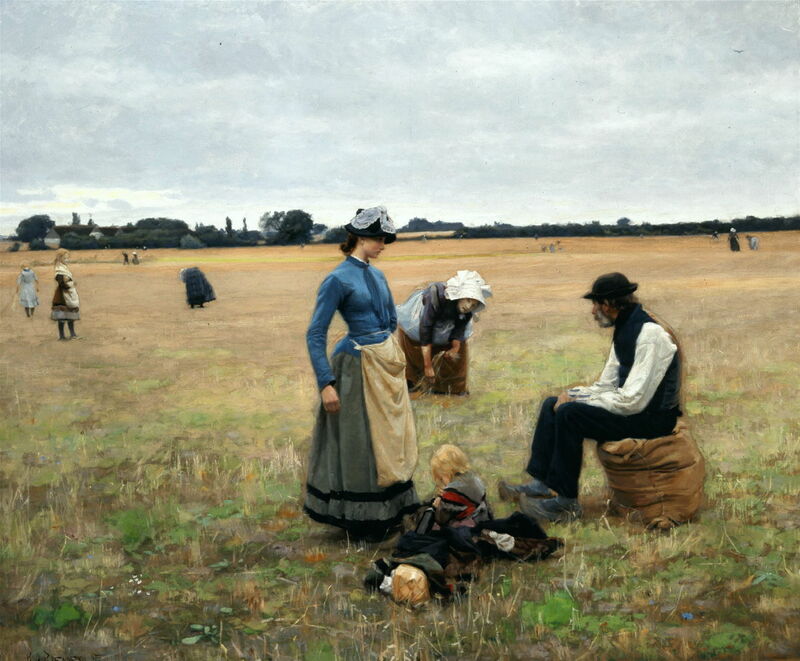 Ring and Brendekilde met when in Copenhagen, and formed a great friendship which saw Brendekilde switch from sculpture to painting in 1881, and both of them influenced by P S Krøyer (who taught Ring for a short period), the Norwegian Christian Krohg, and most of all the French arch-Naturalist Jules Bastien-Lepage, who died unexpectedly in late 1884 after a meteoric rise to fame in the Paris Salon. 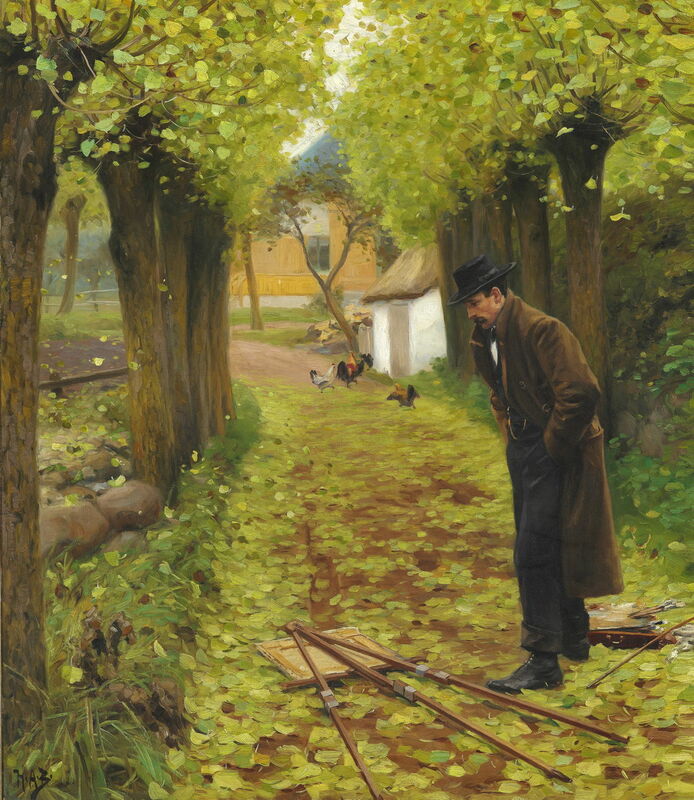 Hans Andersen Brendekilde (1857–1942), L A Ring by his Fallen Easel (1883), oil on canvas, 78 x 67 cm, Det Nationalhistoriske Museum på Frederiksborg Slot, Hillerød, Denmark. Wikimedia Commons. One of Brendekilde’s earliest surviving paintings shows L A Ring by his Fallen Easel (1883). Both of them had a struggle achieving recognition, and at this stage Ring was verging on abandoning art altogether as a result. He is seen on the outskirts of a wood, looking down dejectedly at his easel, which had dropped paint-first onto the fallen leaves on the road. Ring was even contemplating emigrating to America. This is a rarely-seen insight into the difficulties of an artist’s early career. Hans Andersen Brendekilde (1857–1942), Three Little Girls Picking Blackberries (c 1885), oil on canvas, 41 x 48 cm, location not known. Wikimedia Commons. 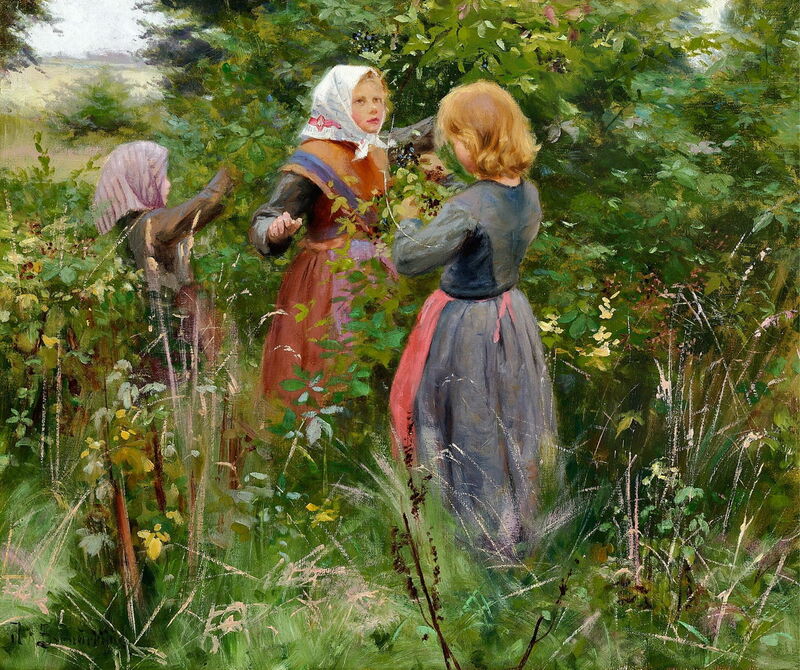 Three Little Girls Picking Blackberries from about 1885 may appear almost sickly sweet like the fruit of its hedgerow, but has a harder story to tell beneath Brendekilde’s wonderfully loose brushstrokes. For children like these girls, picking berries in the late summer wasn’t just fun. Despite their clean hair and folk dress, the fruits of the hedgerows were an essential part of their diet, and would be eked out in jams and conserves over the coming winter. 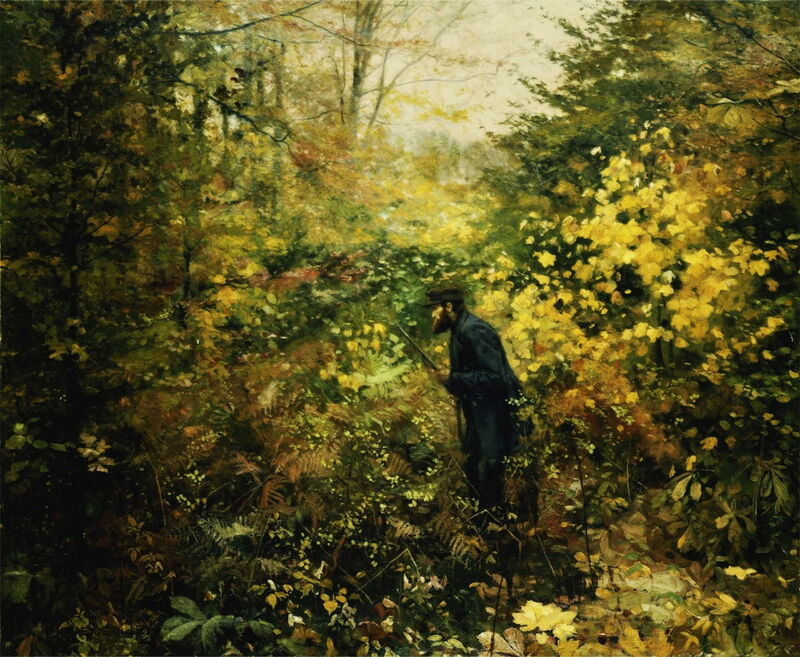 Hans Andersen Brendekilde (1857–1942), On Forbidden Roads (1886), oil on canvas, 126 x 160 cm, location not known. Wikimedia Commons. 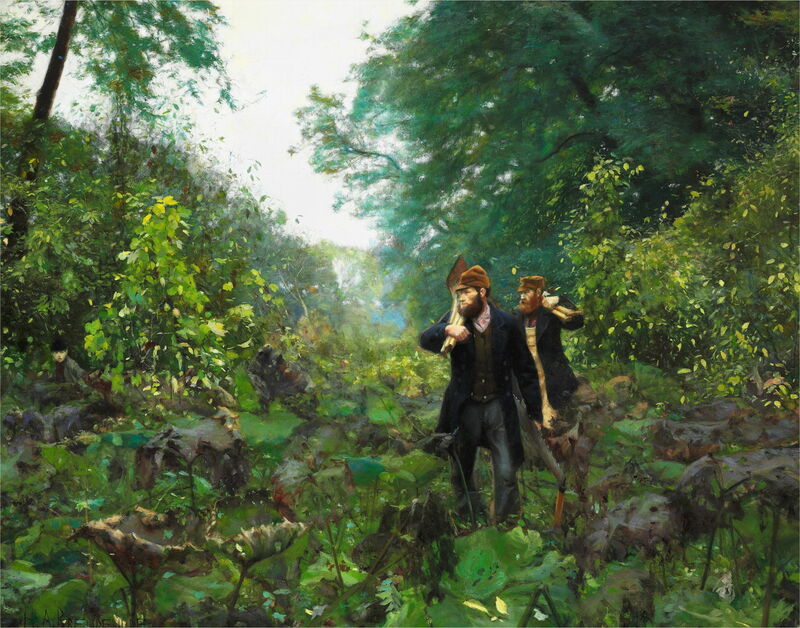 On Forbidden Roads from 1886 shows one of the core themes in Naturalist painting: itinerant workers making their way through neglected corners of the countryside. These two men are equipped for forestry, with a two-man saw, axes, and spades. Almost hidden among the vegetation at the far left is a third figure, who looks anxiously towards them. Maybe none of them should really be there at all. This was first exhibited in Copenhagen in 1888. Hans Andersen Brendekilde (1857–1942), The Rest (1887), oil on canvas, 70 x 91.5 cm, location not known. Wikimedia Commons. One of the most physically-demanding tasks of the year was clearing snow in the winter. The Rest (1887) shows a younger man taking a short break from cutting a track through to the elderly lady’s farmhouse. This painting was exhibited in London in 1907. Cowed (1887) might have been painted by Jules Breton or Jules Bastien-Lepage, perhaps, although it lacks the latter’s sense of extreme breadth of view. Superficially, it shows gleaners at work in a field after the harvest, but there’s much more to its story than that. Being gleaners, the figures seen are among the poorest of the poor. The owner of the large farm in the left distance has gathered in their grain, and their harvesters have been paid off for their effort. Then out come the losers, to scavenge what they can from the barren fields. The family group in front of us consists of three generations: mother is still bent over, hard at work gleaning her handful of corn. Her husband is taking a short break, sitting on the sack in his large blue wooden clogs. Stood looking at him is their daughter, engaged in a serious conversation with her father, as her young child plays on the ground. The daughter is finely-dressed under her coarse gleaning apron, and wears a hat more appropriate to someone ‘in service’ as a maid, or similar, in a rich household in the nearby town. She looks anxious and flushed. She is almost certainly an unmarried mother, abandoned by her young child’s father, and it is surely she who is oppressed or ‘cowed’. Their difficult family discussion is being watched by another young woman at the far left, who might be a younger sister, perhaps. Hans Andersen Brendekilde (1857–1942), The Huntsman (1887), oil on canvas, 126.4 x 153 cm, Private collection. Wikimedia Commons. The Huntsman, or perhaps better as ‘The Hunter’, also from 1887, returns to the theme of suspicious activities taking place in the depths of the country. What is his quarry? Is it a bird, beast, or a trespasser? Brendekilde’s autumn woodland is a real delight here. 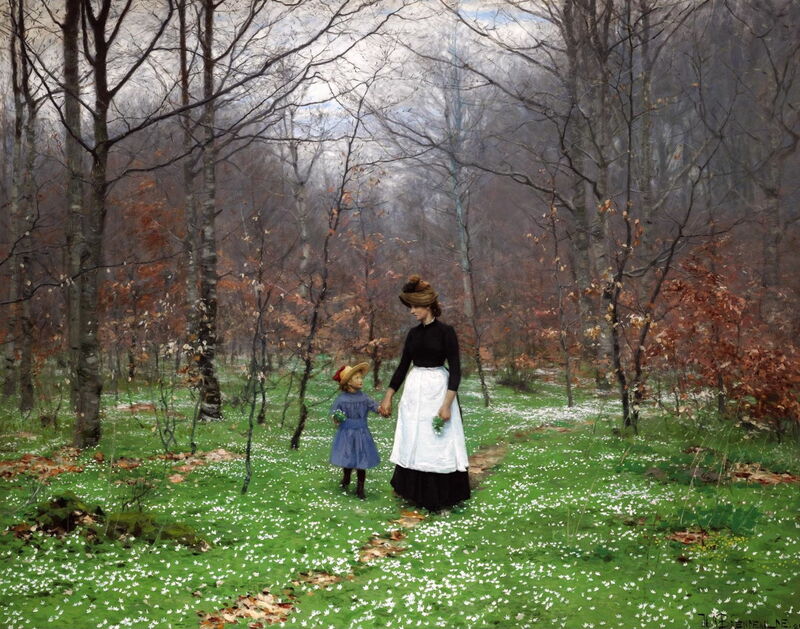 Hans Andersen Brendekilde (1857–1942), Springtime; The First Anemones (1889), oil on canvas, 125.7 x 158.7 cm, Private collection. Wikimedia Commons. The last painting of Brendekilde’s that I have chosen from this period is his exceptional Springtime; The First Anemones, from 1889. A young woman is walking with a small girl in a wood in the early Spring. The open floor of the wood is carpeted with abundant white flowers of wood anemone. The young woman is unlikely to be the girl’s mother. Instead, she wears the black dress and white apron of another woman ‘in service’, in this case probably as the little girl’s maid or nanny. Both hold posies of anemone flowers: the girl holds her up, and is talking with her childhood companion; the woman stares slightly sadly into the distance, and her posy droops towards the ground. Brendekilde’s model for the young woman was one of his favourites, Maren Kristine Hansen (1872–1956), who worked for Brendekilde and his wife, Ida Juliane Antonie Brendekilde (1860–1920). The artist later had an affair with Maren, and they married in 1918 after Ida and Brendekilde had divorced. Tomorrow, I will look at a small selection of L A Ring’s paintings from the same period. Posted in General, Life, Painting and tagged Andersen, Bastien-Lepage, Brendekilde, Breton, Denmark, Krøyer, naturalism, painting, realism, Ring. Bookmark the permalink. Thank you – they are, aren’t they. Unfortunately, I have to compromise between file size and image quality. Relatively few are available at such high resolution anyway. and you should be able to download the same original that I used. If you ever have difficulty finding one, drop me an email and I’ll send you the master that I keep here. I donate during the year to Wikipedia as I use it constantly with my music collection, and other searches, but have never used Wikimedia. I’ll check in to it. Thanks.